Remember that Superior Organ for the Economy Nicolas Maduro created not long ago? 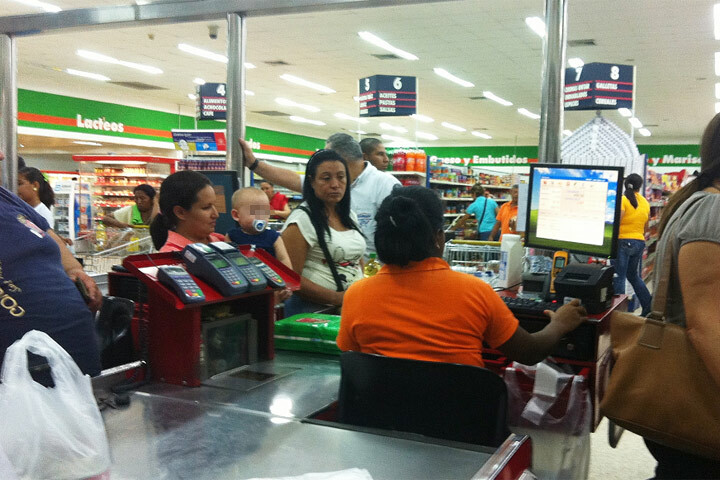 Well, its head, Hébert García Plaza found out during an inspection tour that the real supply crisis in Venezuela is… that there aren’t enough check-out clerks in the supermarkets. Forget about the tons of food in Puerto Cabello waiting to be unloaded from ships, García Plaza believes that empty checkout counters is a more urgent issue. But never worry! He will implement a new 3-point plan that’s going to fix everything: Number 1: There’s this Bolivarian Militia. Number 2: Such militia has a large number of soldiers and Number 3: Those soldiers could go and serve as cashiers at the supermarkets. No kidding, that’s the plan. It makes me wonder how they going to explain to the soldiers that asking people if they have sencillo to pay in cash or asking if they want the receipt for a natural or juridcal person somehow fits the duties of the Militia. UPDATE: The plan is already underway in one State-owned Bicentenario supermarket in Caracas. The soldiers will get a five-day training and instead of their own uniform, they will wear T-Shirts with the eyes of the late comandante eterno.